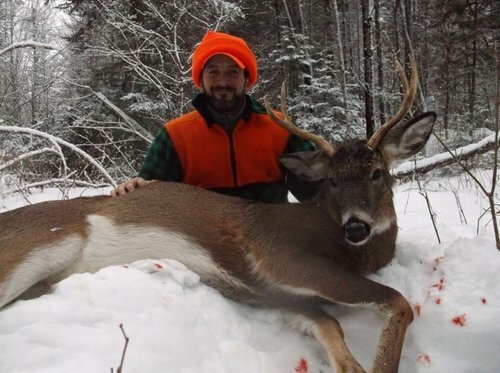 Deer hunting in the State of Maine goes back to the dawn of time. One of the most coveted prizes in the hunting community lies here in our state: "The Big Bucks of Maine Patch". It is awarded to hunters who shoot bucks that weigh 200 lbs or more field dressed. Each year bucks in our region reach nearly 300lbs! Here at 4 Peaks we take pride in our whitetail deer hunting and prepare for the hunting season year-round. With our wide variety of hunting grounds, we offer stand hunting, still hunting, and tracking. We specialize in both archery and firearms hunts. Our hunts include guide, transportation while hunting, lunch and care of game. All hunts are no more than 3 hunters to one guide. That's a promise.